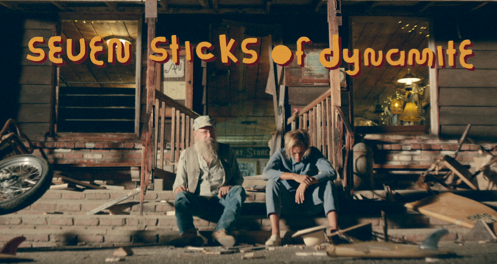 Multi-platinum band AWOLNATION have shared the official music video for the track ‘Seven Sticks Of Dynamite’, which is taken from the band’s third studio album Here Come The Runts out February 2nd, 2018 via Red Bull Records. The video premiered on PEOPLE magazine and was directed by Riley Harper (Hollywood stunt-double for titles such as Little Miss Sunshine, Straight Outta Compton, Sons of Anarchy etc) alongside frontman Aaron Bruno. The video was filmed at The Old Place in Agoura Hills, CA and features legendary tattoo artist Dr Woo, Rick Rubin, and Duff McKagan. Inspired by campy bar brawls in old western movies, the video centres around duelling biker and surfer gangs and, like the song the video builds to an epic climax sure to entertain. Here Come The Runts will be available everywhere February 2nd, 2018. Fans can preorder the album at awolnationmusic.com and receive instant downloads of ‘Seven Sticks Of Dynamite,’ as well as ‘Passion’. In support of Here Come The Runts, AWOLNATION will be embarking on a headlining tour with support from Nothing But Thieves on February 11th in Toronto, and touring the States until mid-March before crossing the pond for a European/UK run throughout the month of April. A full list of dates can be found below.